You're gonna need a bigger bowl. We're big fans of the robotic toy range from Hexbug, and in the past we've tested both the microbot Hexbugs themselves and also recently the amazing Strandbeast. But Hexbug's domain stretches further than dry land and down into the darkest depths of the oceans (well, a five inch plastic fish tank). We got to grips with the Aquabot Shark Tank. 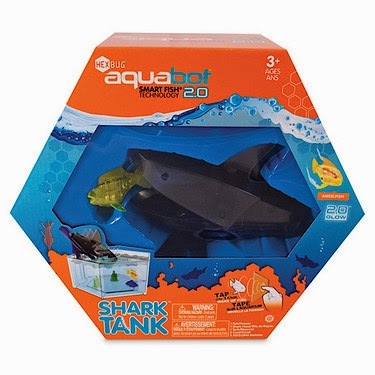 Although when you see the product your attention may immediately be snagged by the robotic-looking shark, it is the Aquabot itself that truly amazes. Like their land-lubbing cousins, these unique aqua Hexbugs actually move about and interact with their environment. The robot fish in this set, the Angelfish, is actually a newer version of an Aquabot and comes with several advancements on the older models. To get your new pet swimming you simply pop him in the water. Sensors on the Aquabot detect the presence of water and start up the on-board motor, causing the fish to swim around the included tank with alarming realism. After five minutes of swimming about the fish will put itself to sleep, remaining still in the water. To reactivate, simply tap the fish tank and your new best friend will awaken and continue swimming. The Angelfish (or Bertie as we called ours) also lights up from within, creating an eerie glow which is great to watch at night. The fish and the tank combined make this definitely worth the price, but the name Shark Tank would be a little misleading without another accessory into the mix. The shark itself is not a robot but rather a push-toy with gnashing jaws. The object (and we thought this was a bit harsh on dear Bertie) is to try and catch your Aquabot in the shark's mouth for no reason other than its a bloody good laugh. However, this is actually a pretty tricky thing to achieve due to the Aquabot's random course around the tank. The addition of the ominously looming shark adds a play element to the classic Aquabot setup, but one we found ourselves growing quickly tired of. Rather we found the Aquabot Shark Tank was most rewarding as a desk novelty, and we would regularly life our heads from tirelessly writing reviews to wake the Angelfish up and watch it swim (and, if we're being honest, stick our fingers in the bowl and give it a wee prod). 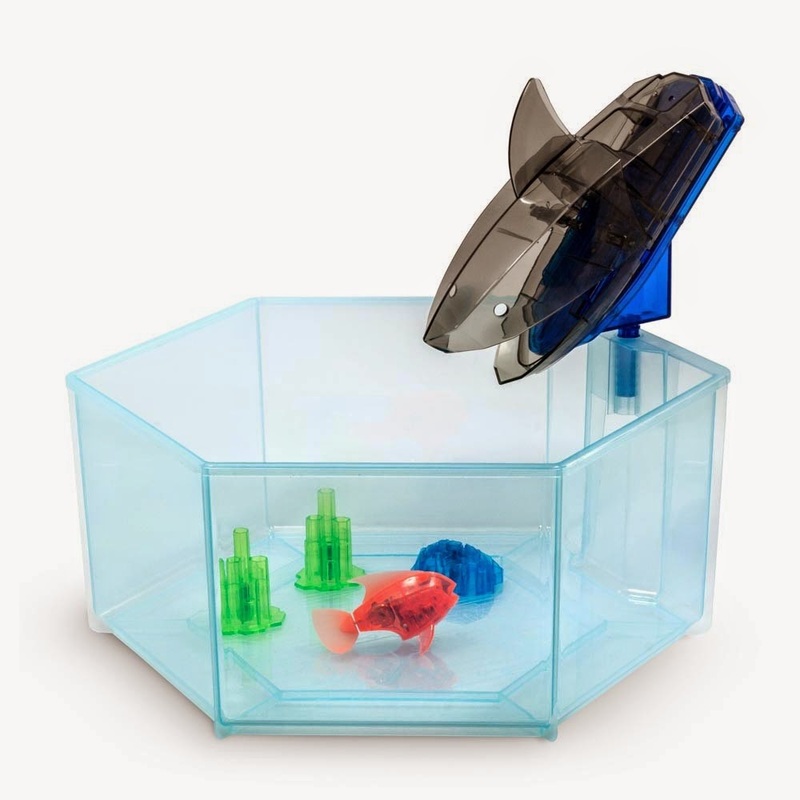 The Hexbug Aquabot Shark Tank would make a great gift for fans of gadgets both old and young. 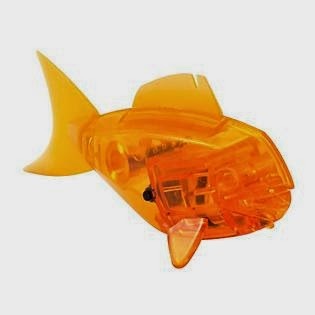 The kids will love the glowing fish and the fact that they can play at catching it in the shark's jaws, while older people - particularly thirty-something technology writers - will love the novelty distraction. One downside though; Aquabots really don't taste very good. Don't eat robotic fish.